I loved this book so much it makes my top 21 business books you must read list. It is very well researched, contains great case studies, and is a manual for creating an organization to be truly proud of. Frederic Laloux also provides a great companion website. 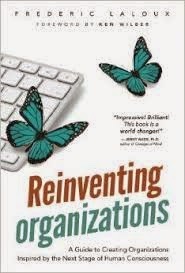 In the book Frederic traces the history of organizations from red (metaphor wolf pack), to amber (metaphor army), to orange (metaphor machine), to green (metaphor family), to teal (metaphor Living organism or system). Orange organizations perhaps still rule the world. Look out for green and particularly teal. Better still build and grow a teal organization. This book details why this really matters and how to go about it.